Grit blasting is one of the main services that we offer. It is used to prepare concrete, stone and masonry, but what exactly does the process involve? At Concrete Renovations, we are often asked about the extensive range of services that we provide to aid with the restoration of historic buildings. One of the main techniques we use is grit blasting. Grit blasting is a process which involves forcibly propelling abrasive materials onto a surface, mostly concrete, stone or masonry, to prepare for upcoming renovation works. This process can be used to smooth, roughen or completely reshape a surface. The abrasive particles are propelled by a centrifugal wheel or air onto the surface. This material is commonly referred to as ‘the media’. All of the differences between the various types of blasting can be found here. 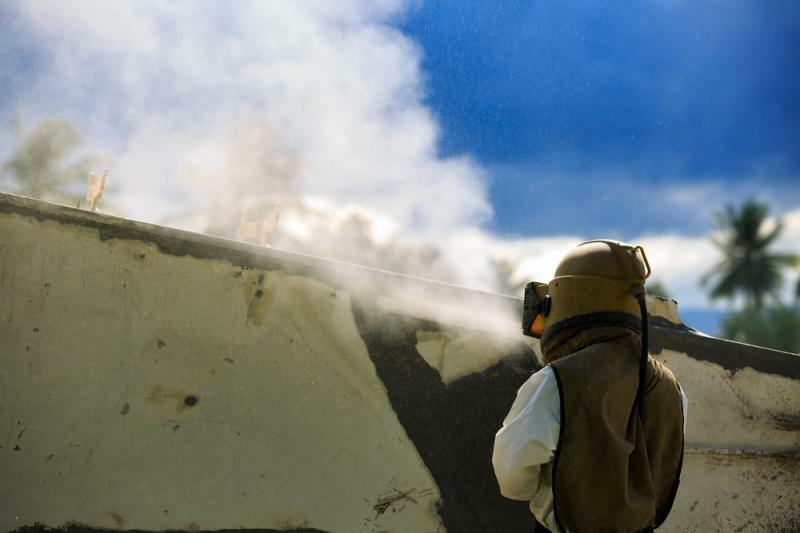 Whatever type of blasting that is employed, the process is designed to prepare the surface ready for renovation work. In order to carry out the work, mobile equipment is used by our team. Mobile dry abrasive blast systems are usually powered by a diesel air compressor, which supplies a high volume of pressurised air. This equipment allows our team to carry out concrete repairs on site in a time efficient manner, without cutting corners and guaranteeing the exceptional quality which has come to be expected by Concrete Renovation. While grit blasting is one of the main services that we offer as part of our renovation works, this process is not exclusive to just heritage sites, by any means. Any building that is showing signs of deterioration can benefit from grit blasting in the preparation stages before repair or restoration. The process is also used to clear the fettling of castings of sand and scale and to prepare metal prior to welding by removing any rust or paint from the surface. Metal surfaces compress from the impact of grit blasting, which helps to reduce stress corrosion cracking in aluminium alloys. If you would like more information on grit blasting and its various forms, or to seek a consultation for a project, please call the Concrete Renovations team today on 01733 560 362.